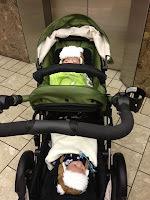 I chose not to register for a stroller until I did some investigating after the twins were born and knew what would work best for us -- a side-by-side stroller, an umbrella stroller, etc. I wanted to get some advice from other twin moms too. Plus, the boys were born in the winter, so I knew we weren't going out for awhile. 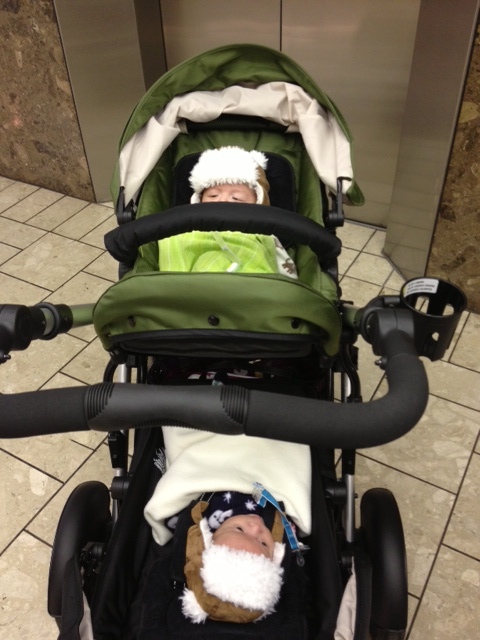 In the interim, we used a basic double Snap 'N Go stroller to hold our infant car seats. We soon called it the "limo," due to how long it was. It would literally turn the corner before us, which was scary. Also, the basic hard tires didn't allow for long rides or urban treks. Once we tried bringing it to Dim Sum with us, but we were blocking all the carts. This experience made us think twice about getting a side-by-side stroller and favor the double-decker-like models instead. That way, we can enter through most doorways and take up less space when eating out, etc. As a result, say hello to our new 2013 BRITAX B-READY stroller with companion seat. It's a modular stroller with over 14 configurations including a second seat for multiples, infants or older siblings. Better yet, you can remove the seats and it can hold two infant car seats. Believe it or not, most double strollers like the Combi Twin, only allow for one infant car seat at a time, thus the misnomer for twins. Quality. It's easy to push/smooth ride. Versatile. It can be used as a single or double stroller. Folds with the second seat still in place. Thus, making my life easier. 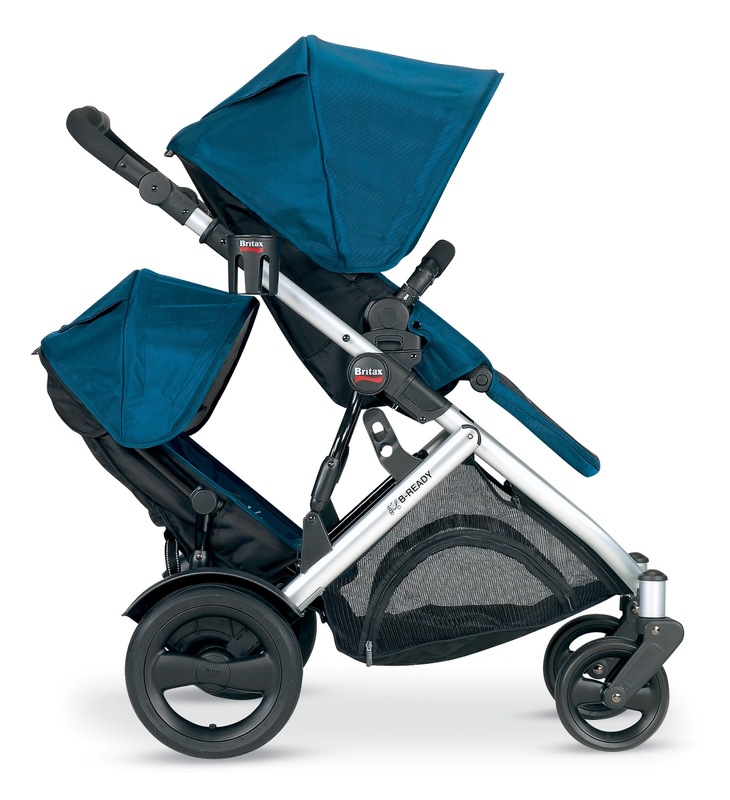 Can fit through tight and crowded spaces like elevators, restaurants and stores unlike side by side double strollers. The top seat can easily move from forward facing to parent facing depending on the day's adventure. Lots of underneath storage space. The Lower Infant Car Seat Adapter allows you to attach an infant car seat in the lower position of the B-READY stroller. A must for twins, this adapter allows you to use both infant car seats in either forward or rear facing positions. It's pretty/bragging rights. Yes, shallow, but true. It's a hot looking stroller and I like that I'm able to put my kids in it. It's also available in nine colorful fashions. We have the new Moss green color that just came out in February 2013. Price: $499.99 and $149.99 for B-READY second seat. Disclaimer: Thanks to Britax for sending us a Britax B-Ready for review. As always, all thoughts and comments are my own. I love love love our B-Ready its perfect for us since we have two kids. The color is beautiful. Thanks for the video! Love seeing it in action. For some reason, the stroller and carseat are the two toughest items to settle on. Now I know why people go through multiple products. Looks good! Thank you for the review! Hi just wondering where you got that nifty belly bar cover? Thanks! Love the video, really helpful! The moss looks great! We installed that bar that goes across the front of the big seat. It kind of just clipped in, but it comes padded. I didn't buy it separately, it comes with the Britax seat. Can i ask few things?? How old were your twins in the pic/video? I am thinking to use this stroller with my 2month boy(maybe with carseat). Is not possible to be self standing with second seat when its folded? Cuz i saw some video that showing b ready can be self standing. I was wondering. My boys were 3 months in the seats, although technically they should be older according to Britax. However, I used the base with the two car seats almost immediately, you just have to buy the infant car seat adapter for the lower seat. When folded with the second seat it usually has to lie down like how i put it in the trunk. However, I never tried standing it up, but I don't think it can. Thank you for reviewing the stroller. Would you know if an infant capsule can go into it by any chance? Yes, you can easily remove the seats and have their infant car seats clip right into the top and bottom holders for a more stable snap and go alternative. We used to do this a lot. This is my very first time that I am visiting here and I’m truly pleasurable to see Scooter Stroller.Wow! Your list is so extensive! I'm sure it helps mom-to-be a lot.